Installation is now older then 11 years. This year, December is not providing a lot of sun. 29.10.2016 ALMOST 10 years ! 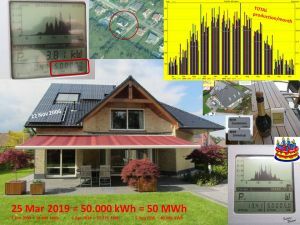 Yesterday, September 5 we did pass the 40.000kWh borderline. We are late August now. This year was not very great as for now related to the SUN and the results from the SOLAR system. Now, at the end from August, we had several days of high temperatures and lots of SUN. A few days to go and we will reach the 40.000kWh borderline. This year, the month of April was very wet, relative cold and did not give us a lot of sunshine. Today it became clear, a new RECORD is broken. We have produced more in 2015 than ever in a CALENDAR-year with this installation. Today we did reach a new milestone. Today, December 31 2014 is over for my solar system. The SUN has gone down and the production dropped to 0 Watts. It is TIME to make my STATISTICAL overview and round up the year. We did reach the NEXT milestone. This installation did produce already more then 30.000 kWh, this is more then 30 MEGA Watt Hour. Sounds as A LOT of energy. Well in fact, it is A LOT of energy. The year 2013 did not give the same results as previous years. Clearly the year with the lowest production results since this installation is operating. No direct worries with my installation since it still produces as it should compare to others here in this region. Today this installation did become 7 years old. Starts counting already. 05.03.2013 25 MWh produced ! Today, March 5 2013 is the date that we did reach the 25000 kWh production quantity. An other milestone for this system. This system is now almost 6 years old and still we are pleased with the overall results. Total production is now 24273 kWh. All this with an installed base from 4000 Wpiek. 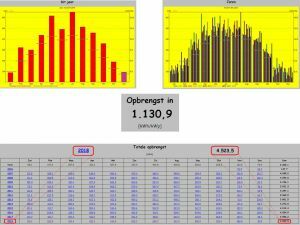 The year 2011 gave us almost 4300 kWh electricity. 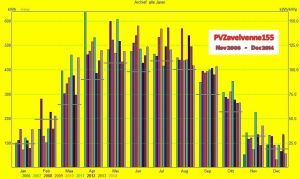 So that year 2011 was the BEST year in terms of RESULTS from our SOLAR system up to now. Alzways nice to brake a record. 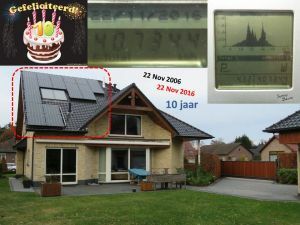 November 22, 2011 is the anniversary day from this PV-installation. This year is going to be a record year up to now. All years have been great actually. 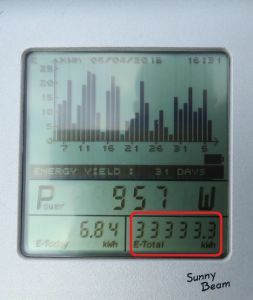 On the anniversary day we have produced 20615 kWh with this 4000 Wpiek installation. 10.04.2011 SOLAR ==> Do it also ! This plant is operational since November 2006. Our street was selected to become the ZONNESTRAAT (SOLARSTREET) for several months (LARGEST number of PV-plants in ONE street in the Flanders). 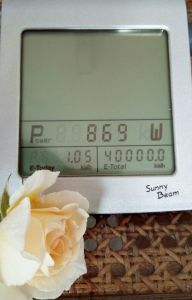 On June 1, 2009 we have reached the 10.000 kWh border.